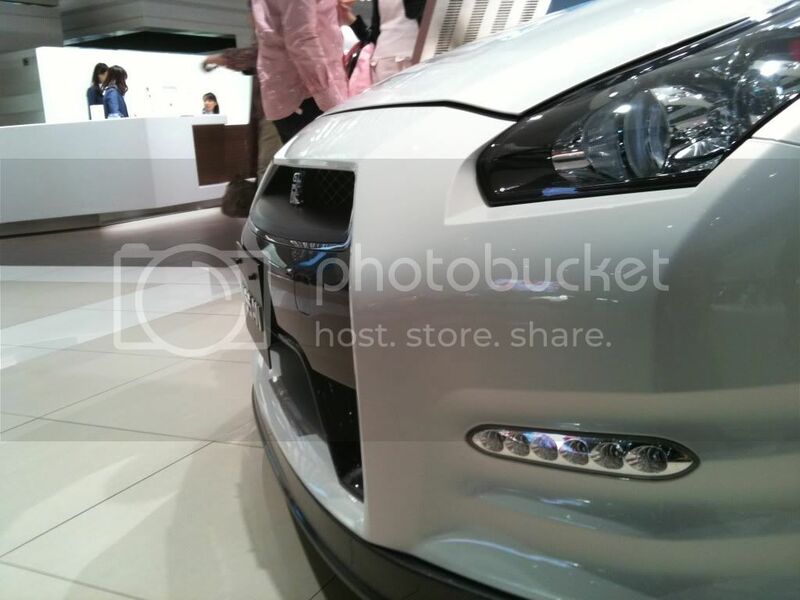 We are covering any information related to the vehicle scene here in Japan. We will detail specific information on exporting, importing, auction, buying, shipping, tuning, and custom car shows. Well... 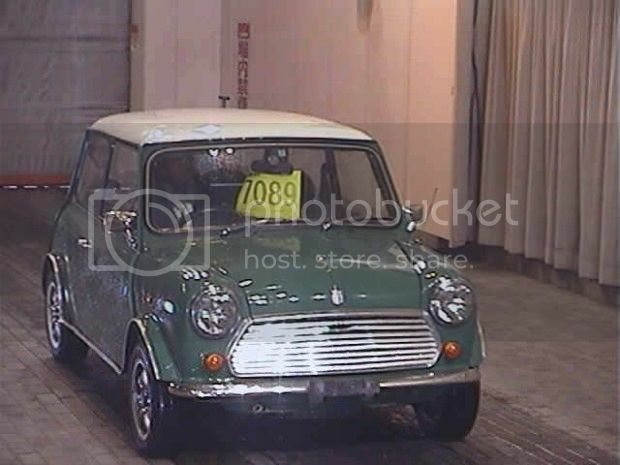 The auction has gone through and I had a non-sold Mini and a bill for 20,000 for the auction. What happened Derek? I thought your car was awesome! Well, it turns out that the car I bought as a "Cooper" model a few months ago, was intact not a Cooper at all. Identification of the Mini model is tricky since there are not many distinguishing features between styles and people tend to customize their Minis. 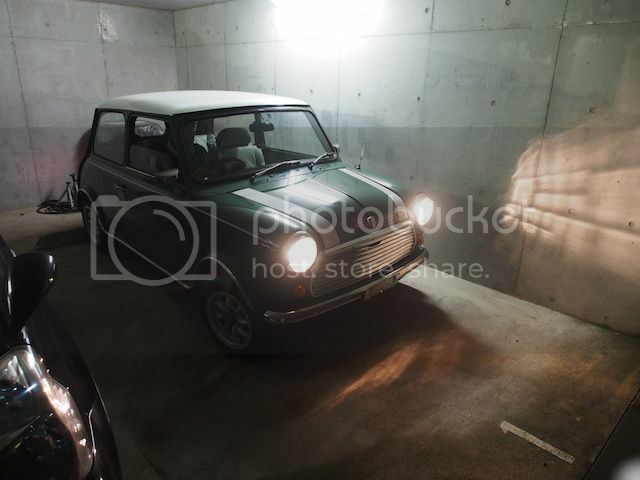 So, the last seller though that this was a Mini Cooper and sold it that way. They must have been convinced by the Cooper seats that were in the car. Had I checked the Vin number, I would have found out right away and could have returned it to the auction. 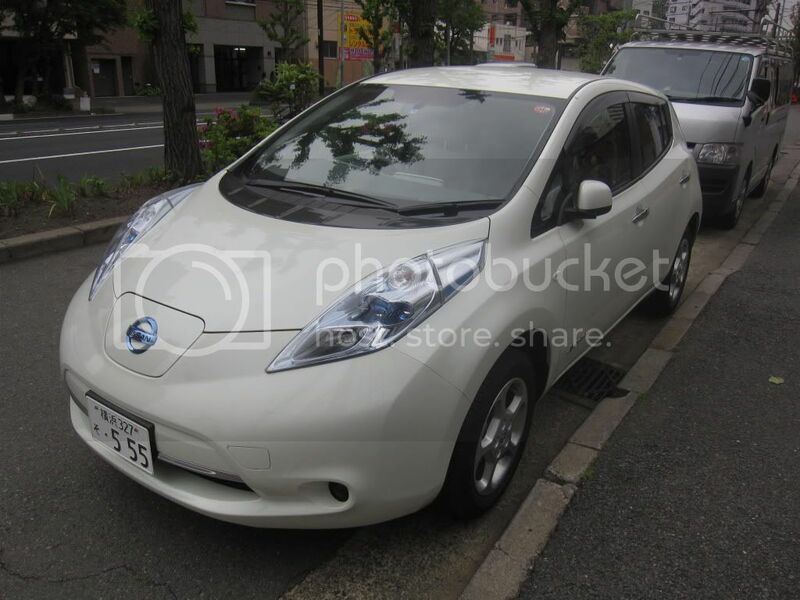 Though for a car that cost only 100,000 yen... and considering how busy I was, it was not a priority. Since it had been so long since I bought the car, I can't return it or ask or a claim. So, the cool "fast" Mini I have is intact a cool slow Mini which may be worth about half the amount. 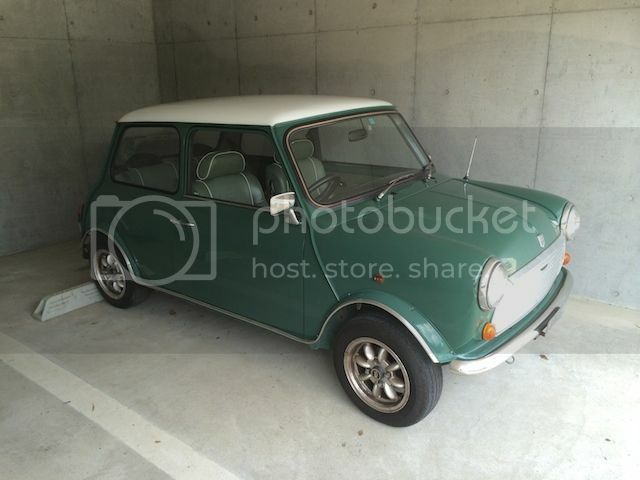 I have told the auction to remove the Cooper listing and list it as a standard Mini. I was also told that I have to mark that this is a 5-digit odometer car on the auction sheet so it is possible that the mileage of 54,000 km might actually be 154,000 km (though considering the condition, I doubt it). So, we have one more week to wait to see how the Mini adventure goes. I assume now that we will only break even on it considering the costs for storage, repair, purchase costs, and selling costs. Since 2008, we have been making Youtube videos for all customers that buy cars. The video started off as a 2-3 minute clip where I would walk around the vehicle. It was really basic. About three years ago, I made a video where I would narrate the walk around. I was really nervous at first because I tend to get stage fright when put on the spot. I spent about 8 minutes walking around the vehicle and explaining the condition of the car, the defects, and the good parts of it. The clip was well received and we started doing this for all of our clients. We have been doing so for about three years now and it has been a surprise source for new customers. The channel is now full of about 6-10 minute long videos of a wide assortment of vehicles. If you are interested in the kinds of vehicles we are selling or would like an up-close look at a certain vehicle, check out the channel and subscribe to get all the updates of new cars. Check it out and send me some comments to the videos. I read the comments. So, the Mini was picked up form my place on Saturday. The driver from the transport company came at 7:00pm and picked it up. He did a walk around of the car, marked the scratches, and was on his way just as soon as he could find the headlight switch. In being a noob at auctions, I stupidly forgot to leave the auction sheet in the car so I had to mail it in to the transport company. 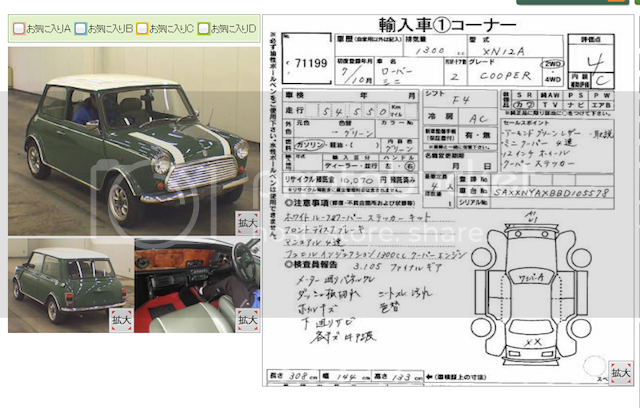 They kept the Mini in their yard and waited for the auction sheet to be sent in. The vehicle arrived at the auction today (Wednesday). It is a little disappointing that I forgot the auction sheet because that delayed the car two days. The auction is tomorrow and this leaves fewer people to notice my car before it goes up for auction tomorrow afternoon. I am satisfied with the auction inspection that they gave the car but there were some surprises. I am always nervous about what they will find. The last car I sold at auction they mentioned animal hair in the car. It must be from my cat... but he has never been near my car. So, I got graded a 4-C. That's respectable. So, not bad. The trunk having been replaced was news to me but perhaps that was done when repainting it? Otherwise, it is quite accurate. Tomorrow it will go up for auction and we will see if I can sell it. With such short notice at the auction, I hope there were enough interested people to have at least two serious bidders. I will update tomorrow with the result. I don't often sell cars at the auctions. I buy plenty of cars, but rarely sell them back to the auction. Why? You see, the dealer auctions are a great place to buy cars for a nice price. But when selling the car, you are on the flip side of that "nice price". So, a few months ago, I bought a 1995 Mini Cooper for a customer. Here she is in the auction photo. 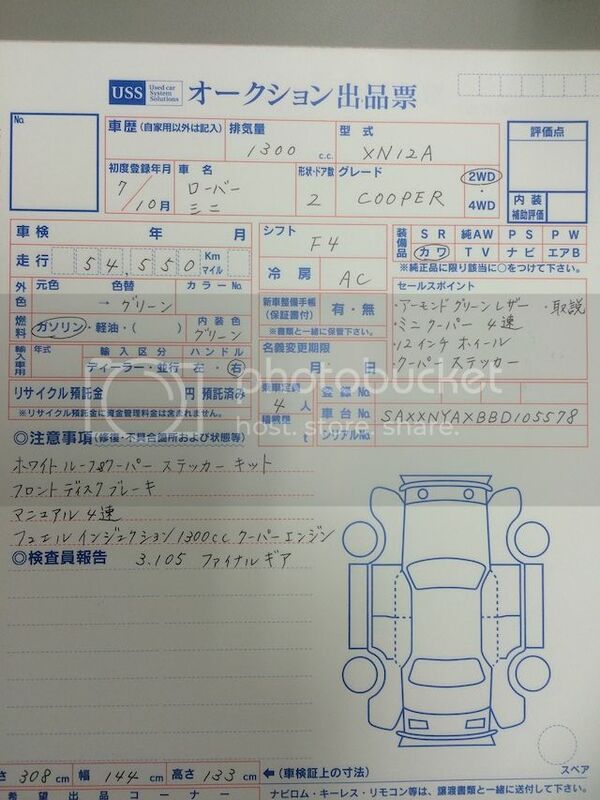 But upon re-checking the auction inspection sheet, it turned out that I had misread it during the translation and missed a point that said that the engine was leaking water. Obviously, that was my fault and so I returned the customer his money and bought the car myself. I took the car back to my place and fixed the leak. Here it is in my parking spot. It happened to be a simple leaking hose at the back of the engine out of sight without removing the other hoses. The repair in total was about 30,000 yen in parts and about 6 hours of my time. I spent about 2 hours cleaning it up after that. Now I have the car in my parking spot at my home while I keep my family car down the road at pay parking. It would be nice to sell the car on the regular market to make some more money but I want my parking spot back as soon as possible... Thus, it will go to the dealer auctions this week. 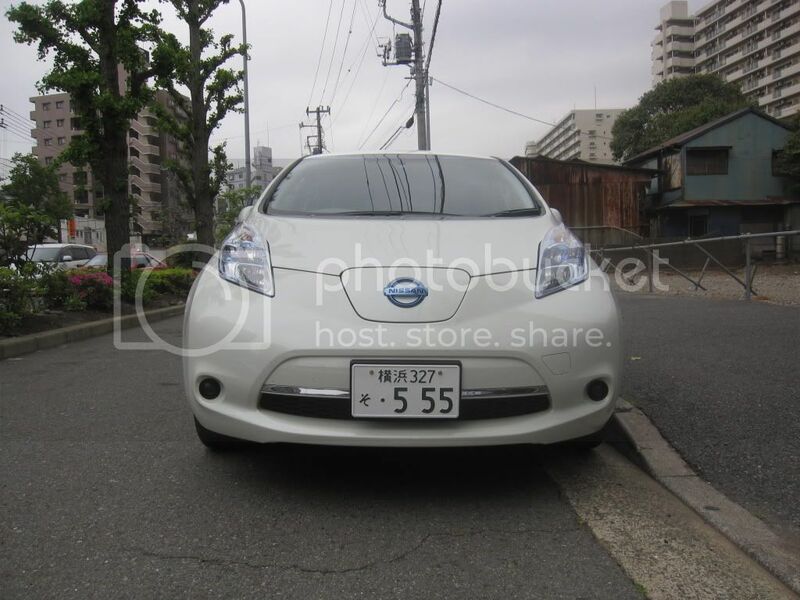 So, I bought the car for 108,000 yen. The car has been re-painted, has been in an accident, and the auction sheet said that the engine will need to be repaired due to the water leak. I am glad to say that the engine is good and strong. The car has had the head gasket checked and it has no leaks. The auction will be in 7 days from now, so I don't know how much I will get but I will update when I sell it. This will be only my third car I have sold at the auction and the other two I was disappointed by the selling price. The overall condition on this Mini is very good compared to most. There is very little rust on the underside, the interior is quite good with green leather seats, it runs and drives well, and the body is quite good. I would like to keep it for myself but I don't have the space or money for a second car right now. Here is the auction sheet. As a seller, we write in all the information you see here, and fax it into the auction. They will inspect the car and write the "Report" section. They also look over the body and mark the parts that are scratched, dented, etc. Stay tuned to see how the auction goes. This is a conclusion to the 2013 Fraud Claim and smear campaign from JDMVIP.com owner Areeb Yasir. In 2013, we were wrongfully accused of fraud. After 1.5 years of preparing for, and going to court, we have now received documented proof that the accusation was incorrect and that Areeb Yasir of JDMVIP.com was mistaken about his fraud claim. Sorry for the lack of updates but some changes to the export business were, and still are, underway. Despite this, I will try to make time for updates to the blog when I have time. I have a bunch of things to report on Japan but will post it up in the coming days and months. 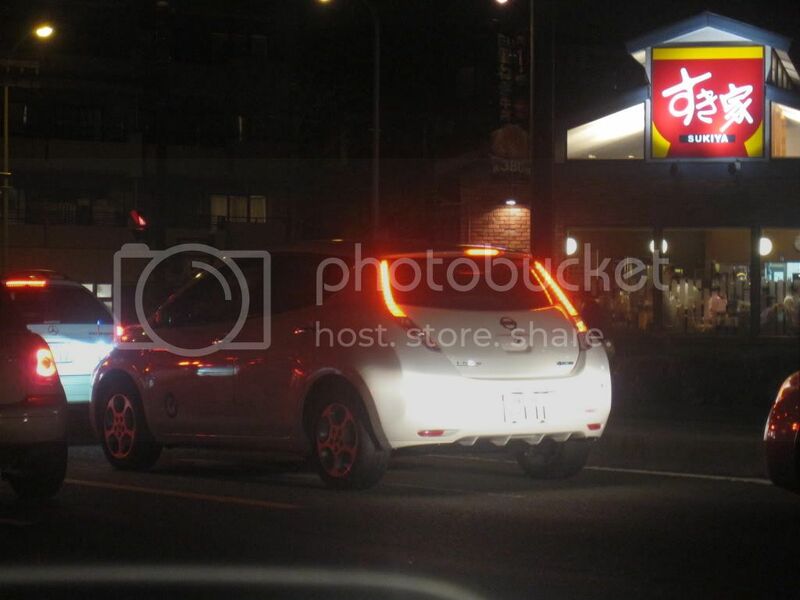 For now, I thought I would report on this while it is still new... For the last two to three months, I have been spying more and more of the new Nissan Leaf. I saw one last night while I was driving. Okay, so it's not a sports car and many people who share the same hobby with me despise the eco-creep that is happening here. HOwever, I really love new technology and this interests me. Here is one I saw today while out for a walk. I don't think I would ever buy one, but I think this car is cool. For the time being, they are a rare sight in all parts of the world. In the coming years they will be very bread and butter and I may change my mind about them. I'm glad that the quirky looks are not so bad in person. 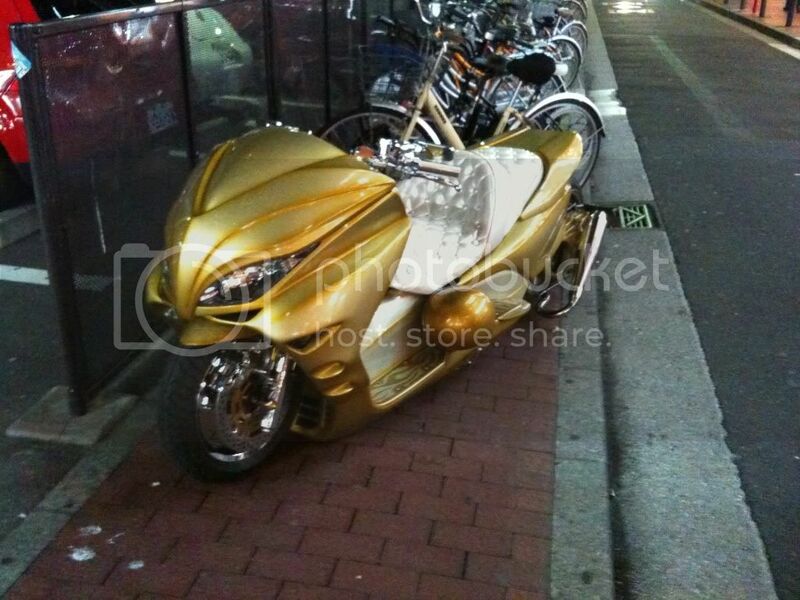 They could be mistaken for any car on the highways here in Japan. 2010 has come to an end now and the start of a brand new year is upon us. 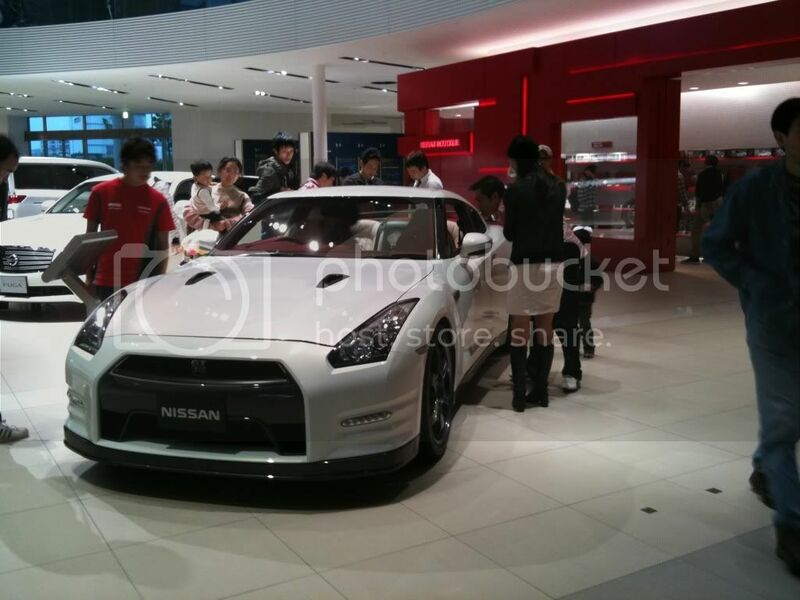 2010 has been an interesting year for Japanese vehicle importing and exporting. 2010 was a year to remember and a very valuable one for Pacific Coast Auto. We saw very steady growth through the whole year and had the ability to work with some fantastic people both in the industry and not. In a year when the Japanese yen hit it's highest in 15 years and long term exporters were closing their doors and scaling back, we were seeign a nice increase in sales and support from our customers. Pacific Coast Auto relies on word of mouth advertising as a primary means of spreading the word and we are happy to report that the investment in our customers is paying off. Thank you everyone who has helped us along the way and an especially big thank you to our customers- whether a first time buyer or a dealer. We couldn't have done it without you. The next year is exciting to look forward to and I promise the Japanese vehicle export market good things from Pacific Coast Auto. Thank you everyone and happy buying from Japan. Ban RHD vehicles in Canada? So recently I had an interview with an anchor on the radio about the perception of RHD vehicles on the road in Canada. It was played by a small local station in Kelowna but every bit helps. I am wondering if anyone heard it. Due to other interviews straying off topic and missing some key points, I went into the interview prepared and made my points strongly, if not shockingly strong. Here is a re-cap of the points I made. Are RHD vehicle more dangerous? For this, I broke it down into two sections. Are the vehicles themselves dangerous? And are they more dangerous due to the position of the driver causing lower visibility and therefore creating danger? Are the vehicles themselves more dangerous? 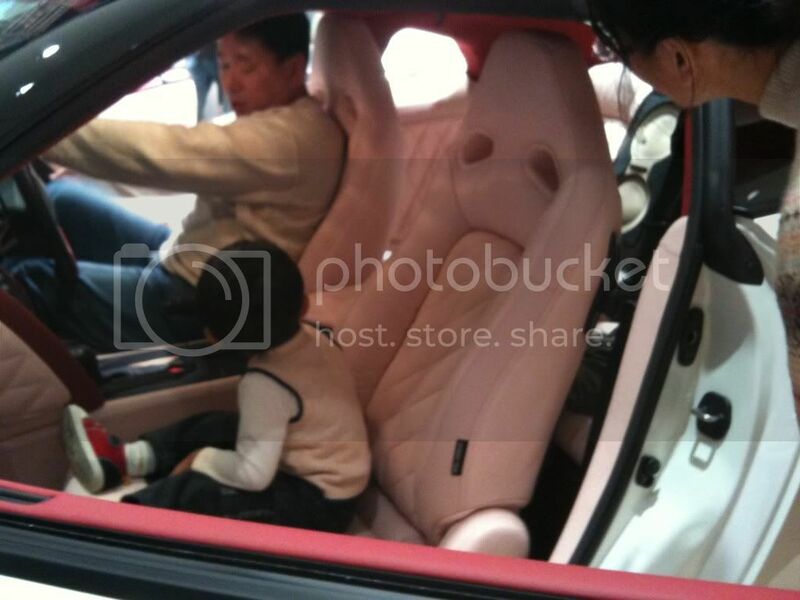 Basically Japan has very similar safety standards to NA vehicles right from off the assembly line. The introduction of secondary safety devices such as air bags, ABS, and traction control were congruent with the rest of the world. However, these vehicles are all 15 years old so it is unfair to compare. I went on to explain that RHD vehicles from Japan have to go through "shaken" registration checks which require any broken or worn part to be replaced in order to pass. Because Canada doesn't have these checks, many vehicles go 5 - 10 years with debilitating problems which cause accidents. Particularly the brakes, suspension, and steering components which all can lead to accidents. I argued that all these things need to be upgraded in order to register in Canada. Are they more dangerous due to the position? When driving a RHD vehicle you have different visibility. Not reduced per say but different. Many people assume that this will cause accidents but if you think about it, why? I highlighted the two areas that are commonly considered dangerous - turning left at an intersection, and passing on a highway. In these two circumstances, I explained that the rules of the road state that you may not do either of these things without having clear visibility. 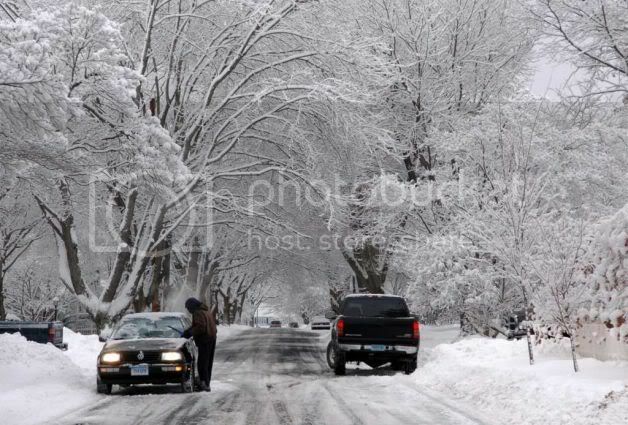 I said it clearly - If you can't see, you don't drive there. This rule is clear and anyone driving a RHD vehicle will be specifically watching for differences like these. The interviewer asked if I thought that this would lead to increased congestion in the roads and I said that these are isolated cases which don't cause trouble or delay in most cases, and that left turn advances are common in high density intersections. 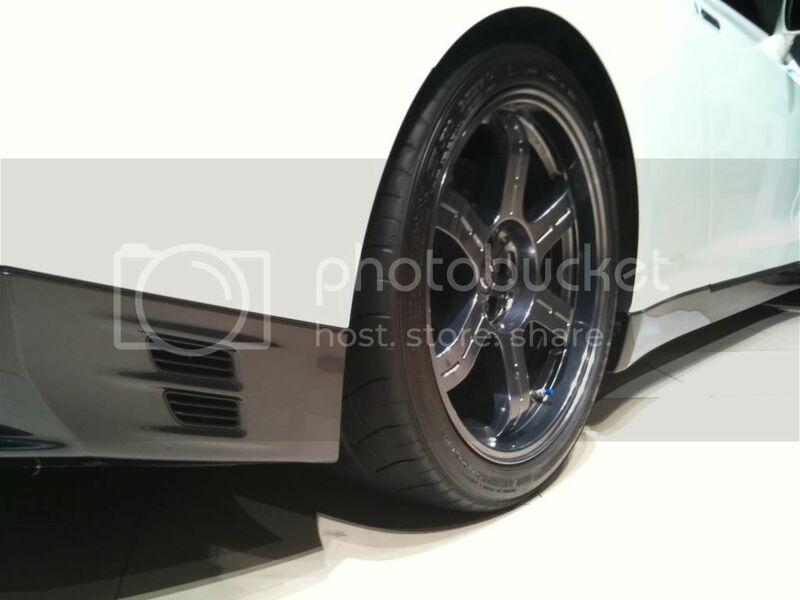 Next I spoke about the street racing accident that was in the news recently and stated that it was my perception that people who are going to street race will do so whether they are in a JDM car or not. Take their Skyline away and they will be back in the street with a Mustang. He asked if I thought that it was irresponsible for exporters like myself to sell high powered vehicles to young people who likely will be racing. I can't choose who I sell to and there is no way for me to know who will street race and who won't. I think that Canada doesn't have enough tracks for people to drive the cars the way they were made to and I mentioned that there is no reason for 450hp in a street car (sorry but true, keep that your track toy... IMO). Next I brought up the point that I wanted to make. That these vehicles are being bullied off the road by large corporations and organizations with lots of money and interest in seeing them off the road. I was accusing, relentless, and straight to the point. First I talked about Insurance companies. I first stated that this is mostly a problem in Ontario and other provinces where insurance is privatized. I explained that these bodies are out to make money and that these JDM cars impose a perceived risk. Insurance companies are risk adverse and don't have data to set prices for these policies. They don't know crash rates or costs to fix them so they are playing it safe. I let them off easy but offered a solution, anyone should be able to insure any vehicle they want and driver's should be able to put an appraised value on their RHD and insure it as a specialty car much the same as you would your kit car. Next I turned to the CADA and exposed them as the reason why these vehicles are being targeted. I brought up the press release that the CADA wrote that called these vehicles dirty, unsafe, cause accidents, and cause street racing which kills people who have small children... If you haven't read the press release then please do, it is awful and equated the importation of our vehicles to a loophole which was never closed (lie). I explained that the CADA is a lobby group with a sole intention of supporting the member dealers who sell cars that compete with these. I brought it up that the CADA states nowhere on their site that they have any interest in supporting public safety and rhetorically asked why they would base a press release on safety. I stated that the members pay dues and the CADA is responsible to only act in the interest of the dealers paying dues. I said very clearly that the CADA is using information that they know is incorrect in order to try to ban RHD vehicles from competing with NADM vehicles. I brought up the ICBC 40% study and explained why it was wrong and dropped the names and positions of the statistics team at UBC which debunked the study along with the official quote written by them (can be found on IVOAC). I mentioned that the CADA had been notified of UBC discrediting the study two weeks before the press release was submitted so there was no reason to use it in the press release unless they were acting unethically. In my closing comment I made a plea to anyone listening. I told people to second guess their perception on the dangers of RHD vehicles. I said that people in Canada hate when big business has control over the government , yet this is exactly what is going on. If you blindly believe that RHD vehicles are dangerous based on what you hear, you are giving more power to the companies an organizations that control your regulations. You are not helping yourself. I did not comment on how ICBC was run by the former president of the CADA since I did not have enough information on that. A special thanks to Calle from Four function Autosports for helping me set up the interview. I remember watching Akira for the first time and like you I was in awe watching the beginning bike scene where Kaneda's band of delinquent 15 year olds took on the opposing bike gang- the clowns. I remember hearing Tetsuo go on about the specs of Kaneda's bike and not understanding the technical terms like redline, RPM, or hubless wheels. 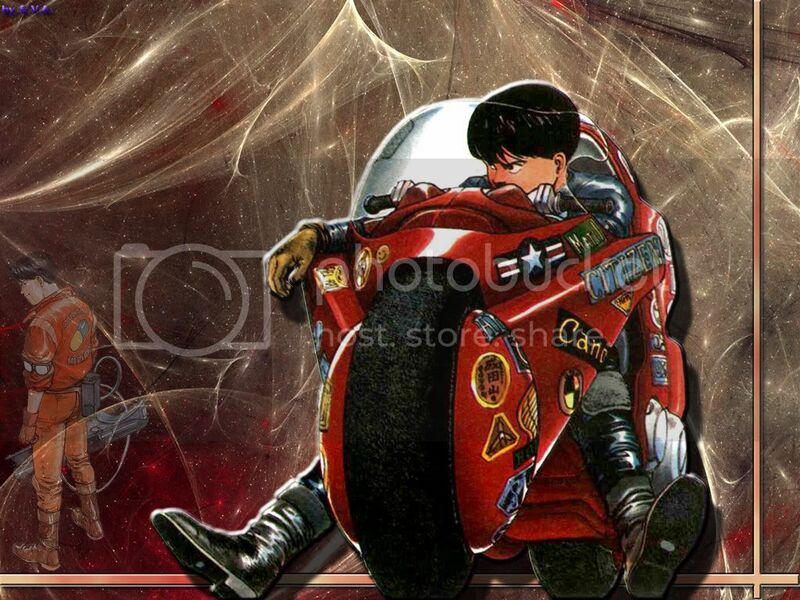 One thing was for certain, Kaneda had a sweet bike. 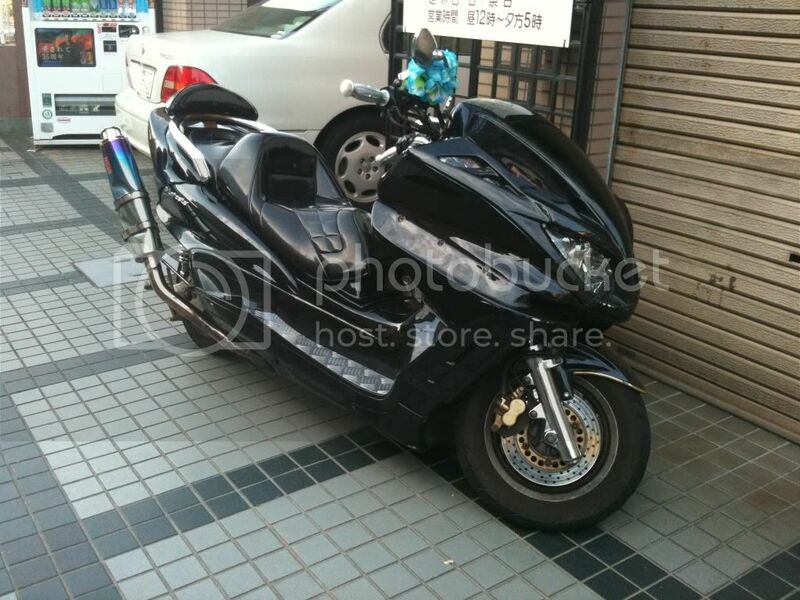 While the rest of the world came to the conclusion that sweet bikes like these were not really practical in the real world, Japan proved eveyone wrong. Here are some examples of bikes I have seen around where I live. All pictures are taken by my iphone. This one is about a 2 minute walk from my house. 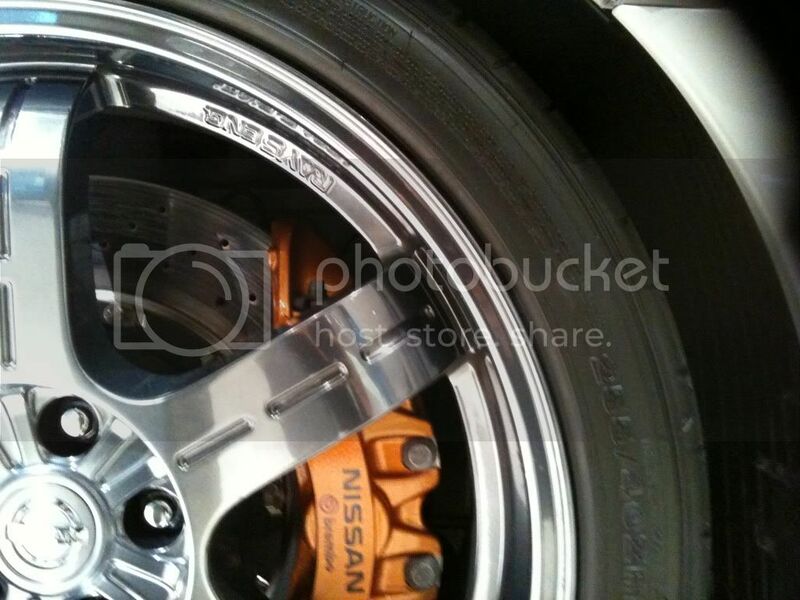 It has upgraded brakes, exhaust, front facia, and has been lowered. Not yet Kaneda style. Colour changing paint, extremely vented brakes with two piston calipers, lowered, and an amazing custom dual exhaust with what must be 30 custom hand welded seams. 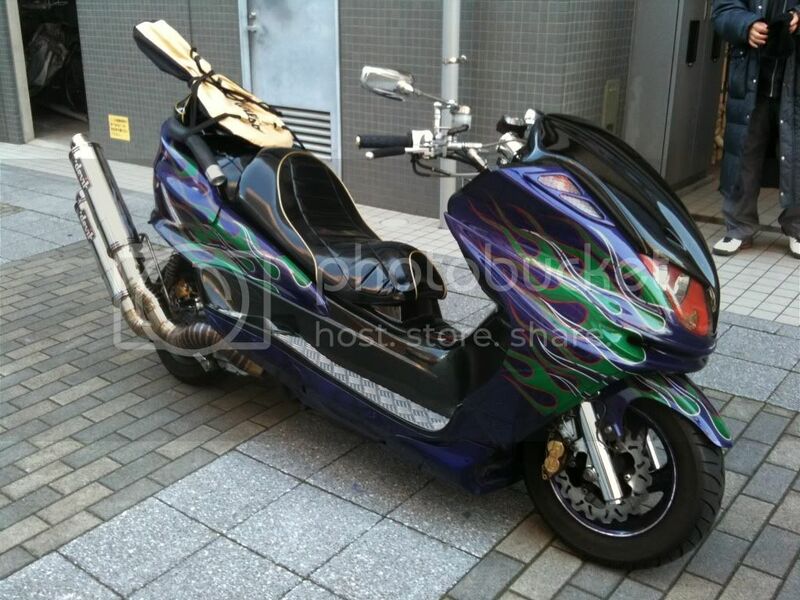 I met the owner of this one... Kaneda is getting interested. Yet it gets weirder still. Check out that extended rear axel! And that height... How can you drive that? 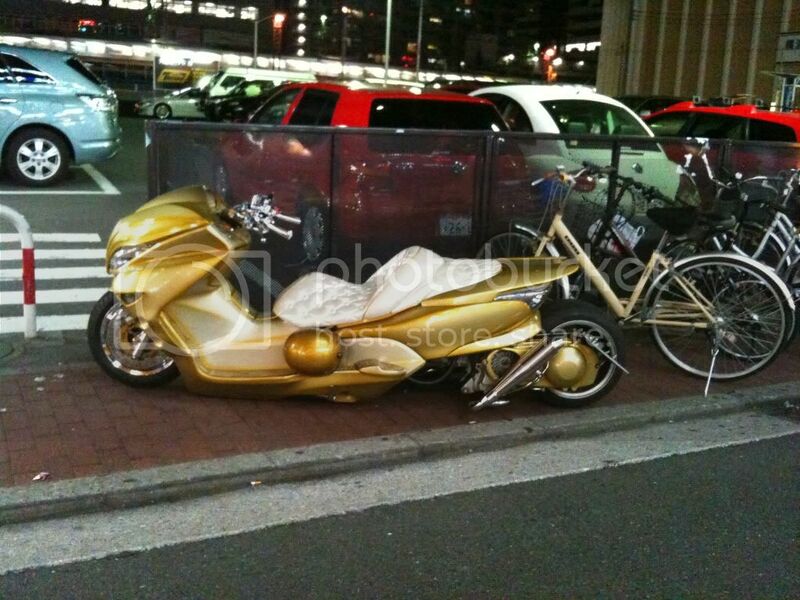 I think we have found a bike for our hero. Now to find some clowns to take out. 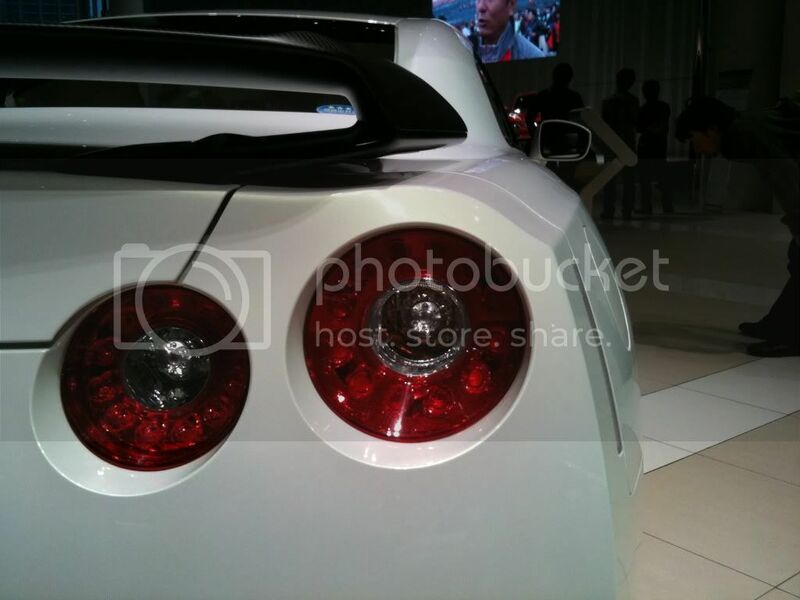 I stopped by the Nissan world headquarters in Yokohama for a quick look at what was there and saw a display of 2011 GTRs. I took some pictures with the only camera I had on me at the time... My trusty iphone. Sorry for the low quality pics. The light sensor in the lens is not so great. For 2011 Nissan has decided to diversify the range and offer three levels of trim- The Egoist was the model that stood out the most since it is the model which addressed the only problem that anyone could think of for the GTR... The interior. 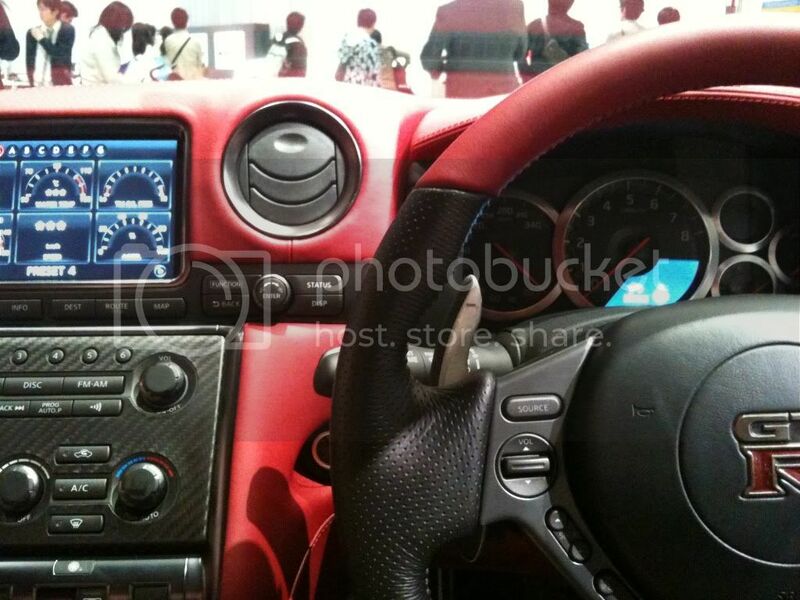 Though the standar GTR never struck me as a car with a bad interior, I like old cars and I am okay with hard plastics. 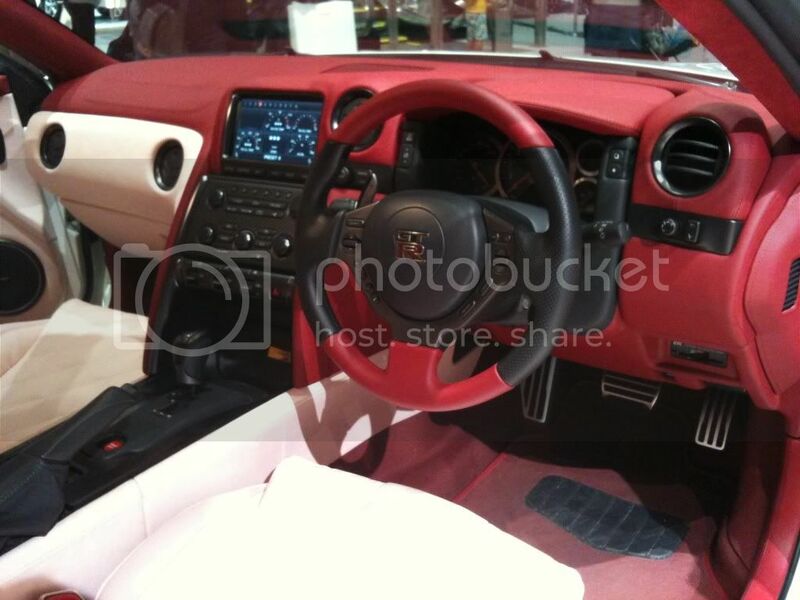 The seats of the original were excellent too but when reading online, all I heard was, "The GTR will never compete with the 911 with that interior." So how much for the Egoist? 15,000,000 yen (about 50% more expensive). I don't know enough to say what else was upgraded besides the interior and the audio but it seems a touch steep compared to the base at about 10,000,000 yen. So, take a look at the new details. Obvious... LED running lights. Gotta have those these days. 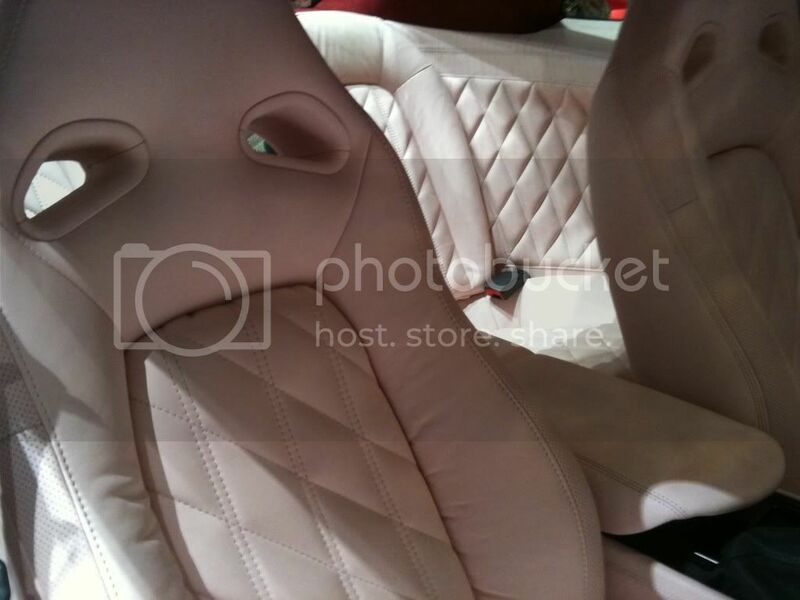 And cool diagonally quilted interior. Sweet! Kids and parents were allowed to come in and climb all over this $150,000 jungle gym. It was hard to see kid-feet standing on such nice seats. The nice information ladies smiled and allowed for such sinister behaviour. 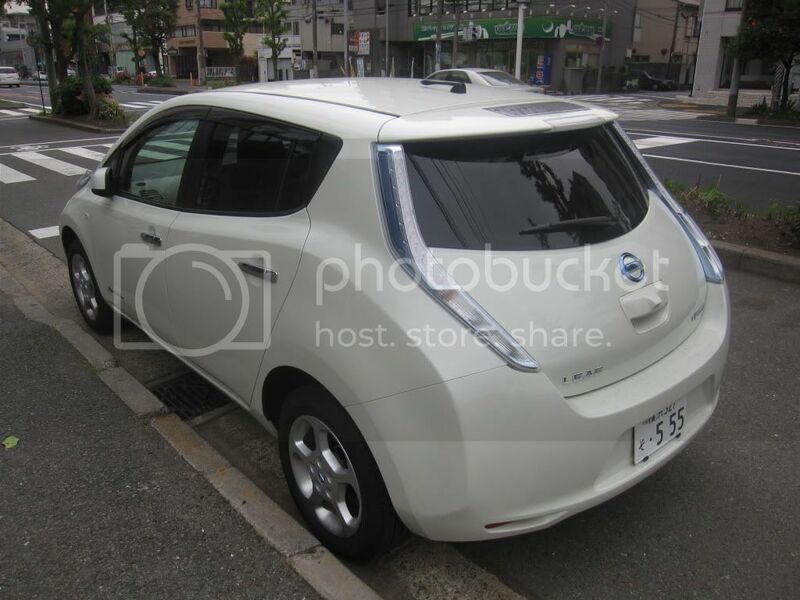 So, here in Japan, we get this car this week. The rest of the world has to wait until February of 2011 as a 2012 model year.